There’s something new beneath an arch of the Maple Avenue Bridge in Redmond, Oregon, 19 miles northeast of Bend: A challenging course for rock climbers. 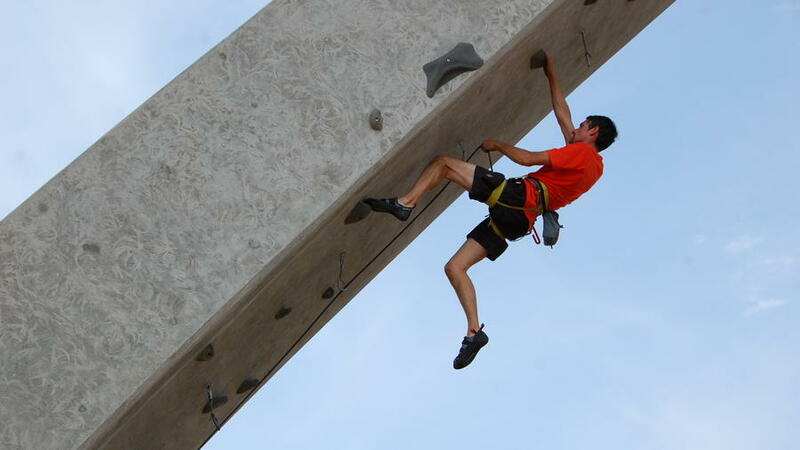 “The first day I saw the arches, I thought–wow–it could be cool to climb them,” says Ian Caldwell (pictured), the expert rock climber and mastermind behind the course. This bridge route is cool in other ways; here’s why. Caldwell, an avid climber, proposed the idea to the Redmond city staff in 2013 after scaling big overhanging routes in Maple Canyon, Utah. Approved by the city council barely a year later, the first leg of the climbing area opened in August 2015, thanks to donations from central Oregon climbers. “The climbing style is fun because it’s steep, more gymnastic,” says Caldwell. The “impossible-looking” route starts at a 45° overhang and finishes at 75°—nearly horizontal! More routes are planned for the bridge’s other arches. If you’re an avid and experienced rock climber, Maple Bridge is a great spot to hone your “steep overhang” skills, which you can’t do on the near vertical faces of world-famous Smith Rock, in Smith Rock State Park (pictured), 8 miles away. Not a climber? Try hiking, biking, jogging, or just exploring in Dry Canyon, which cuts beneath the Maple Avenue Bridge, and for five miles through Redmond’s city center. It’s where the Deschutes River used to flow before nudging its channel westward.